Type K damper drives are also installed in other areas of the Manatee Station. Here, Gary Barnett, Type K Area Sales Manager, inspects units on the station’s Super-Heat and Re-Heat dampers. There certainly is no substitute for speed. In nature, on the athletic field or on the computer, superior speed makes all the difference. Pneumatic-powered damper drives are excellent choices for speed sensitive installations. There are no motor windings or gear sets that can compete on pure speed applications the way a quick acting pnuematic drive can react. For combustion air and flue gas applications, some critical services are very dependent on rapid speed to ensure equipment life, operator safety and peak plant performance. At the Florida Power & Light 3-Unit Manatee Station, a 2,735 MW generating plant in Parrish, Florida, Rotork Type K damper drives have provided a solution to a critical application demanding quick damper operation. lead to irregular heating in the steam tubes. In extreme conditions, excess negative boiler pressure can collapse boiler walls and buckstays, leading to additional catastrophic failures such as ruined boiler tubes and refractory or even wholesale structural damage. The nature of these events often equate to long term unit shutdown, lost kilowatt production, and expensive emergency site construction repairs. Power generation boilers need a somewhat consistent internal operating pressure environment for efficient and manageable combustion. The ID Fans on a combustion boiler play a critical role in maintaining that reliable boiler pressure. The ID Fan Inlet Damper Controls that regulate fan induced pressure and airflow need to be vigilant "soldiers at the ready" to help keep these pressure fluctuations in check. The ID Fan Damper Inlet Drives required for Florida Power & Light Manatee Station Unit s1 & 2 require full 90 degree drive and damper movement at full torque load in 3 seconds or less to safeguard the operation of the boilers. The Type K 'PM Series' Pedestal-Mount TK-6 Damper Drive delivers 5,000 lbs-ft of torque at tested speeds of less than 3 seconds for a full 90-degree stroke. The outage required removal of the original existing drive installed in 1976 in favour of the new Type K Damper Drive for the ID Fan Inlet Dampers. There were four ID Fan installations per unit, or eight total drives in this service at the Manatee Station. Type K has since supplied four identical drives to the FP&L Martin Station on the east coast of Florida. There remain four final drives to install at this location for full completion of all sixteen ID fans. That outage is scheduled for 2013. The existing drives were in excess of 30 years old. 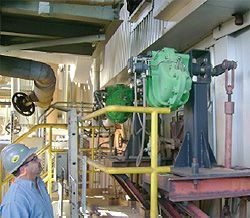 In addition, they were not HART compatible with the plant's new DCS system and the manual overrides were unreliable on the aging damper drives. Type K offered a drop-in-place retrofit drive matching the existing damper drive footprint that featured smart positioner technology and integrated air volume boosters to obtain the rotation speed required. Type K also completed factory acceptance testing on the drives and obtained the test cycle times as recorded by the smart positioner. The results of the testing were video recorded and documented for Florida Power & Light to review prior to shipment. An additional challenge dictated that a hinged man-way door be accessible to service the ID Fan, requiring that the manual override handwheel be rotated to the 12 o-clock position. Type K engineered the solution to the project manager's satisfaction. The on-site performance testing for damper drive speed was conducted at the power plant early on a Sunday morning at about 2:00AM. This was a full load / installed equipment proof-test scheduled typically toward the end of a planned outage. This acceptance test is critical to the build confidence in the plant unit trip and boiler shutdown process. The Type K Drives performed as quickly and as smoothly as factory testing had indicated. At full boiler pressureand damper load, the drives rapidly failed to the fully closed position as required. Passing this test is primary to outage completion and full sign-off for boiler readiness to generate electricity. The trip test was witnessed by several key FP&L personnel at the control room and by field instrumentation technicians at the ID fans. Shawn Gilson and Alan Vance from the Type K Representative in Florida, Gilson Engineering, were instrumental in the Type K specification and were assisted by Dean Stedman, Type K Area Sales Manager.